Summer Guests the River Aura. Jypyä Pop (Turku, Finland) on 14 May 2015 in Lifestyle & Culture and Portfolio. These birds are a few summer time swum the River Aura. Beautiful composition .Tey look big ones ...are they wood boats ? @Mhelene: They are made of fiberglass. Their site is sometimes presented as some kind of dance, but then their throats were standing. Thank you for your interest. Une belle compo et une très belle idée que ces oiseaux! A beautiful colorful decoration on the canal! @Patrick M.: Thank you. 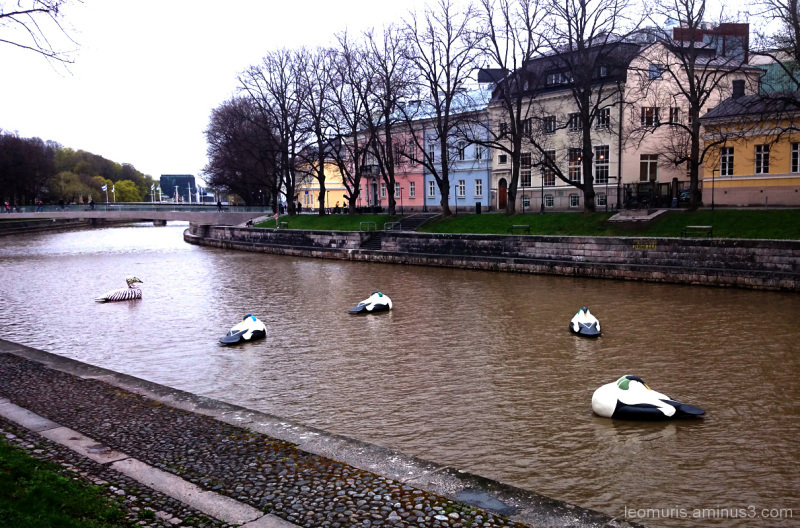 The River Aura in Turku is the same as the Seine in Paris. Lovely birds and lovely houses, really photogenic !!! @Patrick M.: It's great that you think so. Thank you. Both cities are, therefore, fantastic cities. Very nice composition, he finds their summer residence for the enjoyment of tourists. Excellent framing, the picture is superb. @gerard1948: Thank you for your opinion. I also consider this view. Those behind the visible parts are over 100 years old. Birds made of glass fiber, bringing together the old and the new time. Beautiful and peaceful time. I love the colour of those houses in the background. Lovely scene and architecture along the water! Beautiful photo!